My second trimester ultrasound was today. The baby is healthy. She has a strong spine and excellent kidneys. It runs in the family. It has to. And yes...she is a she. We watched our daughter wave at us today. At least, I hope that was a wave. 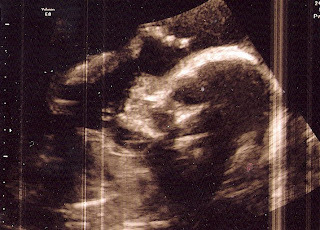 Look closely at the scan and you'll see her hand at the top. It could very well have been a dramatic hand to the forehead. Is she already a drama queen? Is she reciting the 'Sir, spare your threats,' monologue from 'Winter's Tale'? Uh oh. She's her mother's daughter. Merry Christmas, little lady. I can't wait to meet you face to face in May. There's a scene where they go to the school play and their rambunctious toddler runs up on stage and disrupts everything. Uptight moms and dads in the audience start yelling at Steve Martin, "Your son is ruining the whole play!" He hears the ominous roar of a roller coaster in his mind and begins to feel the sensation of a wild ride take over his whole body. He looks to his wife and she's smiling. Here we are at Coop's first holiday concert. They put a golden halo on him. Looks like an angel, don't he? He sang a lovely version of 'Away in a Manger," complete with choreography. 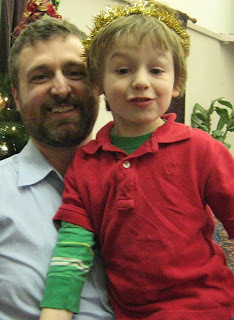 And folks laughed out loud when during their rendition of 'Jingle Bells,' my child yelled out, "HEY DADDY! LOOK AT ME!!!" 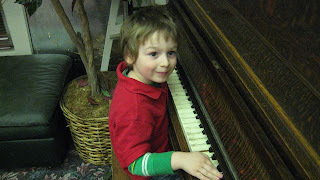 After that, he kept running over to play the piano. 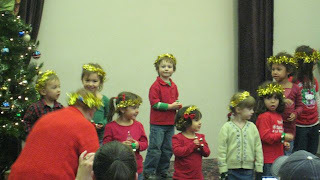 The teachers had to redirect him back onto the stage about 19 times. I was fine with that. 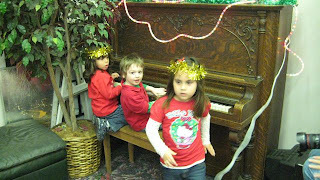 Hey, the kid just wanted to rock out on the ivories. It was after the singing was done that this roller coaster of an evening picked up speed. He must have been all hopped up on sugar cookies or something.Cooper was running around like a maniac. He wasn't listening. He was knocking things over. He grabbed a present from under the tree on the stage and stepped on it. He turned the dials on the microphone amp and caused a feedback sounds that made the whole room gasp. "Thank you, TUJUNGA! Good night!" Despite his not listening and openly defying me when I said, "Stop! Don't touch that! Quite please! Sit please!" 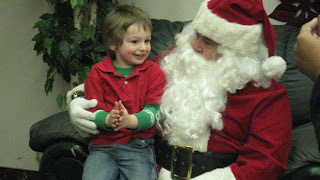 I still stuck around and let him sit on Santa's lap. When Santa asked, "Have you been a good little boy?" Cooper had nothing to say. Pleading the 5th, huh? But I suppose the holidays make us all act a little crazy. When I looked over at Jakob he was smiling. That made me happy. Jakob's always been a guy that hated roller coasters, but he's grown fond of this one.